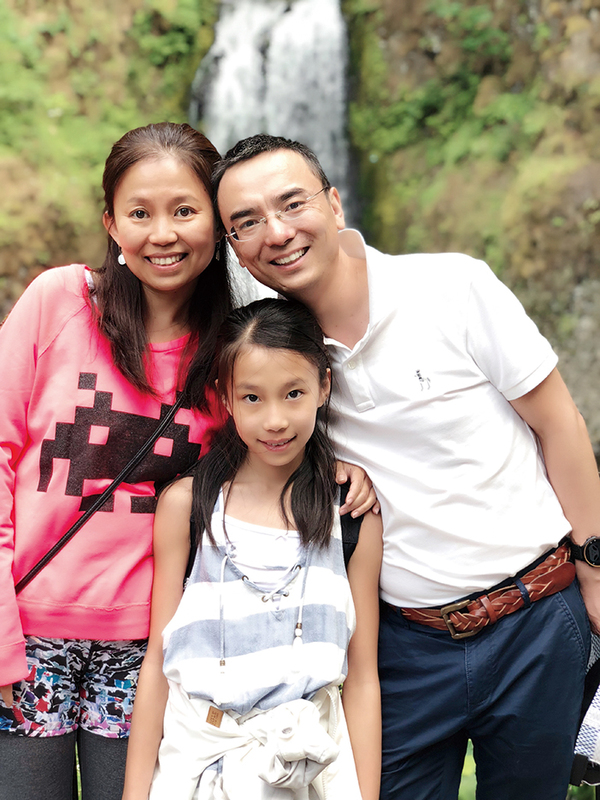 “Asia,” says Claudine Boucaud, “is a great place to raise children, because they get to stay children longer.” She and husband David left Florida 13 years ago, and since then have lived in South Korea and Malaysia. 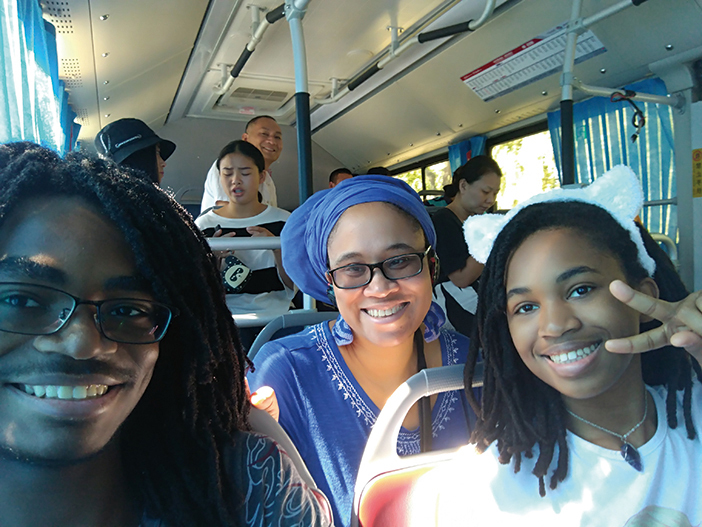 Because of her Jamaican-Chinese heritage Boucaud always wanted to live in China, but the push to move to Beijing came from her children, Esat (17) and Tsehai (15), who wanted to live in a big city. David, a student and writer, homeschools the kids while Claudine teaches at a bilingual international school. Have you ever been a volunteer? If so, what did you do? How old were you when you first volunteered? I never had the opportunity to volunteer as a child. It was not a common practice for children to volunteer in my community. I first started volunteering as an adult, as a peer counselor for La Leche League. I have also served as a Disaster Relief volunteer for the Red Cross. What kind of voluntary work do your children do? All of their recent volunteer experiences have been related to books! My teenagers currently volunteer at a local charity. Here, their main responsibilities involve quality control of donated books. They also sort and box books for upcoming book fairs. In the past, they have volunteered by reading English stories to Grade 1 students weekly in a “reading club”. Last year, they helped to create a trilingual library at a local school. At this school, they digitally cataloged, labeled and shelved at least 2,000 books. Did the idea of volunteering come from you or your children? How did it come about? Whilst the initial idea came from me, they were always eager to volunteer. I have always encouraged my children to value volunteering because of its many benefits: learning new skills, finding passions, and giving back to others; and volunteer hours are highly appreciated on university applications. What kind of challenges or problems have they encountered while volunteering? Finding opportunities in Beijing have been challenging. The first place I checked was the science museum; It was near our house and my children love science. I was shifted from department to department, and eventually I was told children (teenagers) were not welcomed as volunteers, as the museum policy refuses to risk hindering the student’s education. The first place that accepted my daughter as a volunteer was a pet shelter. After two weeks, she begged me to stop going because they limited her ability to help, especially when the tasks they provided her so greatly differed from what was outlined. They only wanted her to sit and hold puppies; they said having a foreigner would attract customers. She was very disappointed, because she wanted to be able to do something more meaningful. How do your children balance volunteering with the demands of schoolwork? My children attend school virtually; therefore, they have a more flexible schedule than others. They currently volunteer at a fixed time for three hours weekly. How do children benefit from volunteering? What other charitable activities have your children been involved in? They have participated in voluntary peer-tutoring and marathons. As a family, we have participated in park clean-ups. Do you have any advice for other families who might be considering volunteering? My main advice for any families considering volunteering is that they make sure that it actually fits into their schedule. Several people want to volunteer, however they don’t realize the amount of time dedicated. Furthermore even if you do have the time, it substantially helps if you find something that you are actually excited about, as the emotional drain of doing something unenjoyable week after week has damaging effects on one’s desire to help. Overall, volunteering, especially as a family, is a wonderful way to give a little back to the world that has done so much to help and you and to truly make a difference: just remember not to rush into it without thinking of the best approach. Daniel Wang is a programmer for an Internet company, and his wife Ivy Yang is the founder of 3i Art Center. Their daughter Lucy Wang, currently in Grade 7 of Beijing World Youth Academy (BWYA), has always loved animals. She has kept dozens of different kinds of animals, starting with an injured stray dog which the family saved, and her ambition is to become a zoologist. Although the family members have different hobbies and interests, they are all devoted to helping others. In 2013, I did tutoring for parents for a year, at FEL (Family Education Love Center). By chance, I got to know about their family education tutorial, and as a father of a seven-year-old child, I was impressed. FEL is committed to improving the education of migrant children and their families, bringing children and parents closer together, promoting reasonable and effective discipline for children, and improving family members’ mental health. The curriculum is geared towards parents, mainly sharing methods and case studies, and encouraging parents to take action to improve relationships with their children. My wife has been volunteering since she was 16, using her artistic skills to paint murals for schools and communities. After years of working in art education, she founded 3i Art Center in 2006, hoping to give more children access to quality art education. In 2015, our daughter came into contact with HOPE equestrian rehabilitation institute when she was learning to ride. Using trained horses, under professional guidance, HOPE provide equine therapy to autistic and disabled children from care homes. 3i Art Center later became one of HOPE’s sponsors. What kind of voluntary work does your child do? From the age of 3, my daughter began to help people with her art works. When she was 11 years old, she participated in a charity sale organized by HOPE. She spent over ten hours on a horse head sculpture, and donated the money raised at an auction. In 2018, as a volunteer translator for the parents’ union of BWYA, she was recognized and appreciated by teachers and parents. In October this year, she organized and participated in an art environment design project of Grade 7 students at the school, and she has volunteered at art exhibitions multiple times. Did the idea of volunteering come from you or your child? How did it come about? In the beginning, we as parents took her with us when volunteering, so she could get a feel for it. She’s gone from watching from the sidelines, to participating, to making her own choice of volunteer work. Lucy loves animals, so it was a natural progression from riding a horse to becoming a volunteer for equestrian rehabilitation. What kind of challenges or problems has she encountered while volunteering? My daughter has encountered different challenges in each volunteer activity, such as teamwork, division of labor, and how to develop the self-esteem of others. She needed to constantly learn and improve. In the process, she encountered problems such as insufficient materials and temporary personnel changes, and dealing with emergencies. All these were very important to the experience. How does your child balance volunteering with the demands of schoolwork? In fact, planned volunteering does not affect academic performance. Improving her abilities in various aspects through volunteering will also help with her studies. The obvious gains include achievement in school service, improvement in social ability, recognition from parents and neighbors, besides this the gains are teamwork, problem solving, rising to challenges, persistence, communication skills, and other abilities have also improved. Less tangible impacts include greater understanding of the world, appreciating different cultures, paying more attention to human nature, respect for others, and understanding social values. What other charitable activities has your child been involved in? When she was 3 years old, she participated in a charity sale for children with cerebral palsy; at 9 years old, she participated in a charity sale for a school for orphaned girls. The parents should take the lead. Instead of teaching the children big words, you should let them know and feel that the world is very big, people’s living conditions vary greatly, and you can help others through small actions. A parent leading by example will give a child more motivation to accept and take part in volunteer work from the heart. Don’t rush the child into a big commitment. It’s enough to let them start with doing something helpful to others within their capabilities in daily life. You also need to consider the cost. Let children fully realize that volunteering costs money or time. There is no return, but rather through perseverance and teamwork, to do what they enjoy and what is worthwhile.